I love my mornings in Winter Park, Colorado. Hiking trails behind our place just off Highway 40 lead into the forest, along Columbine lined paths, through patches of aspen forests, and along the cool waters of Vasquez Creek on the Blue Sky Trail. This morning frost was on the ground, and deer watched me from the shadows of the pine trees. The path I follow is an easy out and back hike that takes me a little over 5 miles round trip, and it is how I start most days when we're not on the road or in another state. One of my favorite parts of the trail is coming over Ice Hill towards Vasquez Creek. In the mornings - just a little after sunrise when the air is still cold - the sunlight streams through the trees making for a memorable scene. Sometimes when morning mist lingers in the air, it feels as though you are walking into the light of another world - so serene and mysterious. 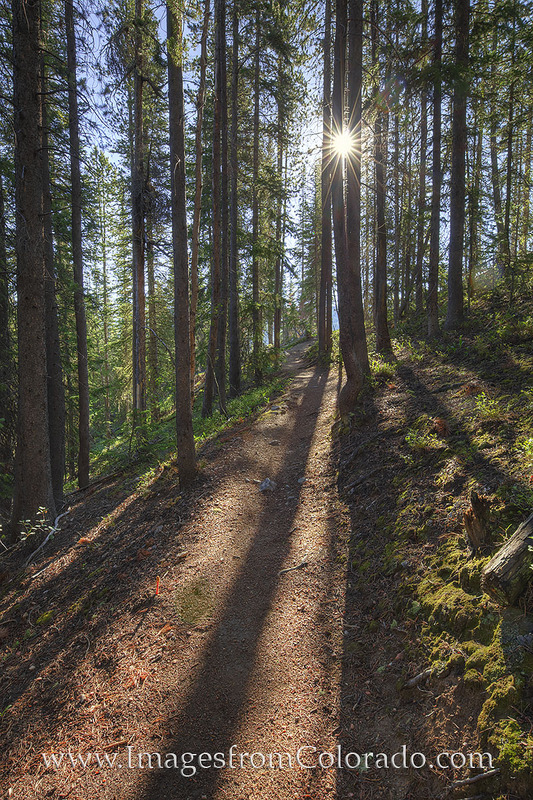 One one of my favorite hiking trails near Winter Park, this is sunshine beaming through the trees on Ice Hill. I walk this path on the days I'm in town, and the early morning light of the Rocky Mountains never ceases to inspire and amaze me. Further down, heartleaf arnica, wild roses, and other Colorado Wildflowers fill in the quiet areas along the trail. Often, I'll see deer and even an occasional moose. Sometimes a robin will come down and hop along the path in front of me, eventually flying back into the forest. 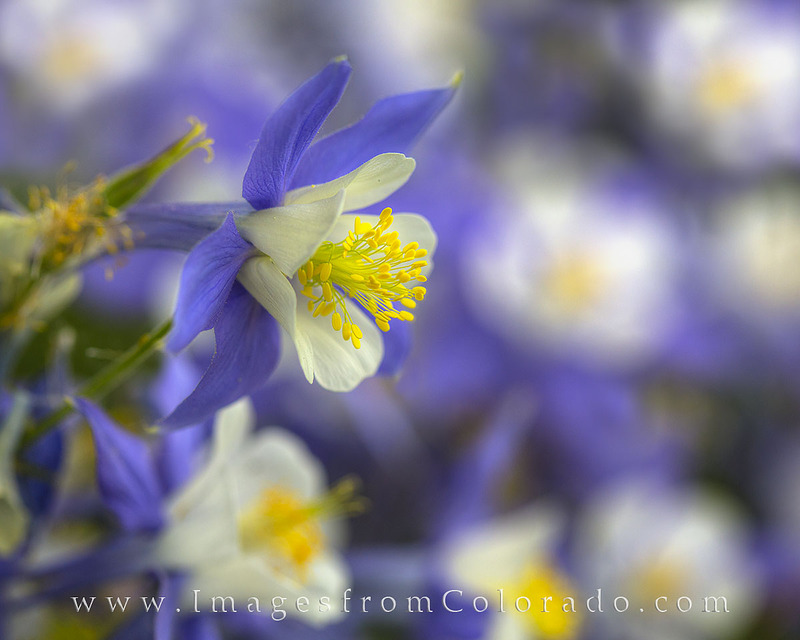 As the state wildflower of Colorado, the Columbine blooms in early summer - June and July - and fills meadows and rocky crags with shades of blue. Its arrival bids farewell to spring and welcomes warmer weather. An alternative trail from Ice Hill takes me high above the train tracks paralleling Highway 40. Along this trail, Columbine rest in the shade near Aspen trees. I know if I follow the trail this direction, I can eventually end up near the Winter Park ski area. All in all, this is a nice way to start the day before returning to our little place and working on the day's projects. If you have any questions about these photographs from Winter Park, please do not hesitate to contact me. Posted in wildflowers, hiking, mountains and tagged winter park, Colorado, hiking, wildflowers, summer, morning, sunrise, Vasquez creek.